Vietnam and China have smoothed over tensions, but a long-term solution remains elusive. As The Diplomat reported earlier, Vietnam sent a special envoy to China for bilateral talks this week. Politburo member Le Hong Anh, acting as a special envoy from Communist Party of Vietnam (CPV) General-Secretary Nguyen Phu Trong, met with high-ranking Chinese leaders. Anh’s visit was embraced by both sides as a chance to mend bilateral ties that soured earlier this summer during a standoff over the placement of a Chinese oil rig in disputed waters. Anh met with Chinese President (and CCP General-Secretary) Xi Jinping on Wednesday afternoon. During their meeting, Xi emphasized the common bond between the two countries, as neighbors and communist regimes. 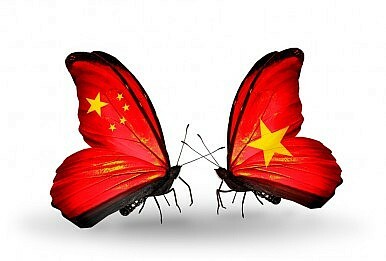 As Xi put it, “A neighbor cannot be moved away and it is in the common interests of both sides to be friendly to each other.” This, in essence, is the root of China’s “neighborhood diplomacy” policy — acknowledging that friendly ties with the countries in China’s immediate area will be the most important factor in providing a peaceful environment for China’s continued rise. In terms of concrete solutions, Anh’s meeting with Liu Yunshan, a member of the Politburo Standing Committee, had more to offer. Liu said that both Hanoi and Beijing were “unwilling to see” the relationship continue to be “tense and difficult.” To move forward, Chinese and Vietnamese officials agreed to avoid actions that might exacerbate maritime disputes. While the progress made is promising, it’s also telling that China and Vietnam are pledging to return to a previous agreement — one that clearly was not enough to keep current tensions from arising in the first place. The October 2011 agreement, which established biannual border negotiations as well as setting up a hotline between the two governments, was of little use when tensions actually ramped up. It neither prevented China from putting its oil rig near the Paracels nor allowed for quick and decisive resolution of the stand-off. Instead, tensions dragged out for months with no resolution. The October 2011 agreement is a feel-good arrangement in times of peace, but when push comes to shove it’s already been proven ineffective. It’s unlikely that the current agreement (which largely relies on a renewed commitment to the 2011 version) will be a game changer. Both China and Vietnam have repeatedly indicated they have no intention of changing their fundamental positions on sovereignty issues, meaning the best case scenario in the short-term is a simply shelving of the disputes. On paper, that’s what the two sides have agreed to do — but different interpretations of what constitutes a “dispute” and a “complication” could render the agreement effectively meaningless. For example, many analysts (including The Diplomat’s Dingding Chen) fully expect China’s oil rig to return to disputed waters as part of Beijing’s strategy to assert sovereignty over the region. Beijing could easily do so while still claiming to be upholding its agreement with Vietnam. How? China does not recognize the Paracel Islands as under dispute — and thus can choose not to see its placement of an oil rig in their vicinity as “complicating” any dispute. For now, however, China and Vietnam are moving forward with their relationship. During Anh’s visit, the two sides announced that they would resume cooperation on defense and trade, but the relationship remains fragile as long as it is subject to major disruptions every few years. China and Vietnam vowed to keep ties strong during a visit from CPV secretary Nguyen Phu Trong.